Dhokla is another recipe made with similar ingredients but how different is that from a khandwi......while the one holds all the sweet n sour n hot syrup inside the air pockets , the other is rolled over the same flavors with a nutty texture of sesame to flaunt........both are delight to have ...and that is for sure!! After all this gyan ( is it?) , i must tell you that the khandwi is an easy snack , believe me ....many of my friends think that i make them because i can make so many other difficult things with ease.......but i want to make them understand that this is an easy and healthy snack.........i am posting this recipe on request of some friends and also to show them that this is an easy one........you just need to understand the consistency of the batter and work quickly.......within a time of 10 minutes you see yourself cutting the strips and rolling them...believe me..
To make the tempering ...... heat oil in a small pan...throw in asafoetida and rai grains...wait till it crackles and then throw in sesame seeds and the finely chopped green chillies ...as the oil is less you may need to stir the mixture while cooking........now out all the chopped curry patta in it and roast slowly on low flame ( as it will get burnt in very less oil ).......pour 1/2 cup of water n let it boil...add 1 tbsp of sugar and let it dissolve......take off the flame and add the lemon juice and keep aside till needed. OMG sangeeta..its a new recipe for me..Wonderful Recipe ! Looks Awesome ! 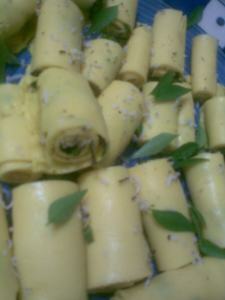 I m really impressed by the method..good1 dear..keep sharing these kind of recipes dear..As always nice presentation. 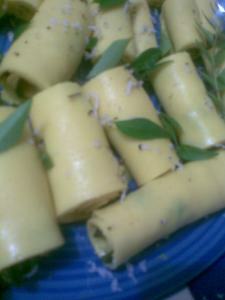 lovely khandvi dear........froma long time wanted to try this, but did not find proper step by step discription, now I got it, so sure will try....thanks for the post. This is one of my all time favorites Sangeeta, and you have explained this so well. 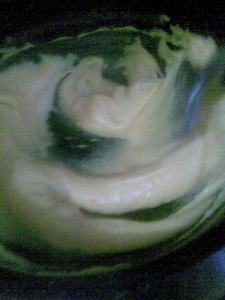 I normally make the paste/ batter in microwave and it turns out easy. Great reminder...I will tell my wife to make, she was good at it...Once I remind her, it will be easier for her to phase me out of the Kitchen.. Your narration on pasta is really good. I am planning to get back to Italian cooking, but the problem is I did not know the actual taste of a good olive oil while I was in India...and the Indian Parmesan is hopelessly bad.. ANyway it is still OK to use available olive oil and make dishes where Parmesan is not needed. omygod! 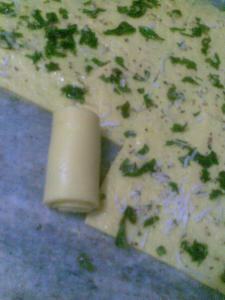 how easy you make khandvi sound! even after being born and brought up in gujarat, i have seen very few people actually make this dish at home.. may be coz you get it at the farsanwala so easily..
but then, i will try soon. 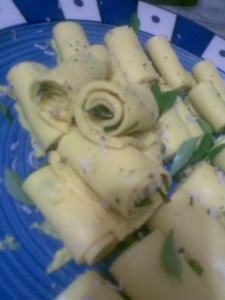 very nicely described with the photos and all..
Khandvi wow oh! so yumm..they are so light I can eat any number :) lovely recipe presentation. Wow!!! It's looking absolutely gorgeous ...I am gonna try this for sure. Sangeeta, your friends are right in assuming it is a difficult dish, because it is. I have tried making it at home and let me tell you, it was tough and not at all easy. Of course, I was following 'Show me the Curry' site, and the ladies made it in the microwave but even with the video tutorial, mine did not turn out good. 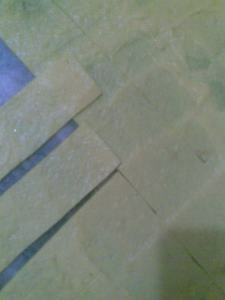 The rols break when the batter is not cooked well, is too dry hence has been spread thick. 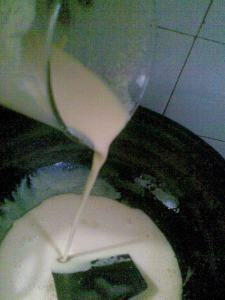 We need a pliable and yet sticky dough after cooking the batter. Follow the instructions and let me know if it still breaks. 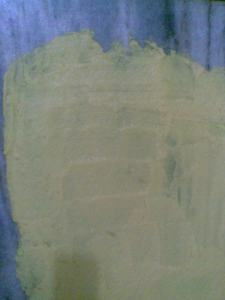 Once the batter is not cooked well, and it breaks while rolling , nothing much can be done. So it will be better to just spread the tempering and serve it like open sandwiches. I would like to take this to a friend's house. How much ahead of time can I make it? I haven't seen them 'filled' before, that would be tastier and hopefully less falling on the floor when people pick up the roll. You can make it a day ahead and served chilled if you wish but the fresh ones taste better and keep well for 3-4 hours easily. 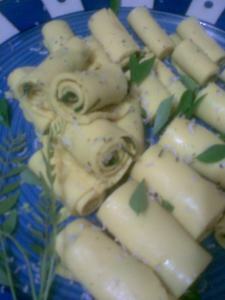 Khandvi is a wonderful party snack and you can secure each roll with a toothpick.